Fiona Hall elegantly transforms the detritus of everyday life into art. Even her early black-and-white photographs from the 1970s – for instance of vacuum cleaners gathered in a backyard or early morning dew suspended on a fine network of mesh – are poetic images which elevate the potentially ordinary to a lyrical, even sensual, dimension. Hall’s art is diverse and not limited by medium. She paints, carves, photographs, sews and assembles using various items such as soap, video, glass beads, plastic tubing, paper money, sardine cans, plastic containers and Coca Cola cans. In her choice of materials and their physical appearance she metaphorically invests her work with contemporary issues. The material quality of the objects interprets our relationship with nature. 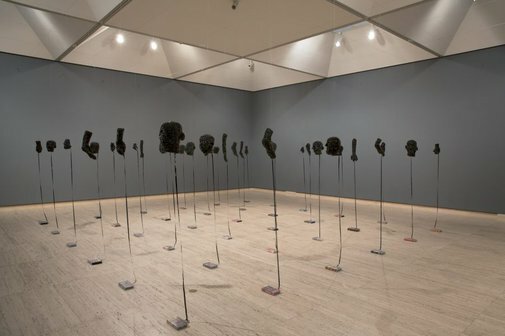 Hall has said that her work ‘slides around in the territory of the structure of things’.1 Her complex art subtly explores the relationship between nature and culture, scientific classification, the body, the histories of Western civilisation, in particular colonisation, and our present cultural moment. The forms and shapes of her objects are derived from the world around us, referencing its mixture of fecundity and decay; an innate capacity to personify both fragile beauty and resounding pathos. The 36 body parts knitted from video tape in ‘Slash and burn’ typify this aspect of Hall’s work. 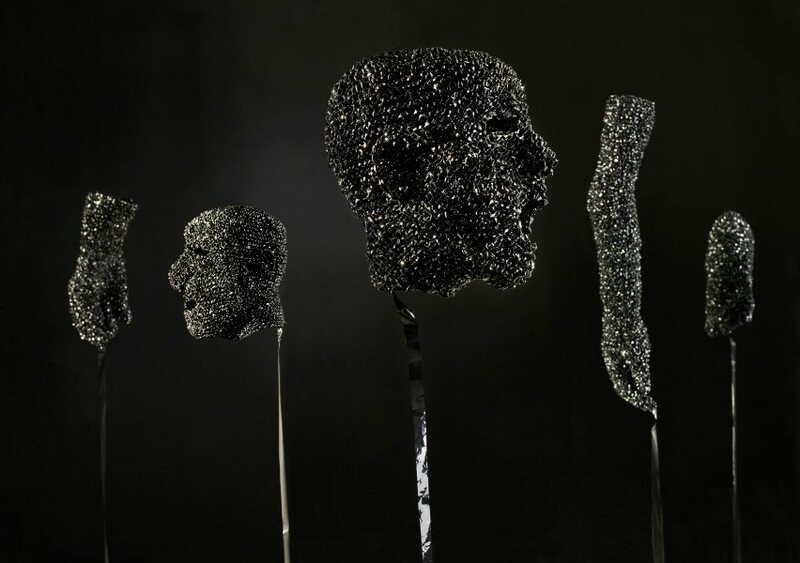 Here, the shiny, sumptuous surface detail of the faces knitted from videotape is coupled with their vacant expressions, mouths open in disbelief. Suspended, the heads, hands and feet are attached by a single line of videotape to 36 video cases on the floor. The various body parts are knitted from war films including ‘Apocalypse now’ and ‘Gallipoli’. There is an intriguing contrast between the gravity of the subject matter and the synthetic weightlessness of the electronic medium, drawing attention to the role of the media in glorifying violence. The titles of the films suggest the atrocities that human beings have committed against one another during war. The title ‘Slash and burn’ is an agricultural term for clearing the land. In this work the term is equated with the ethnic cleansing that has plagued many parts of the world. Hall believes there is no hope for the sustainability of nature until human beings begin to treat one another with greater respect and understanding. ‘Cash crop’ 1998 (AGNSW collection) elaborates similar sentiments, exploring the connections between trade, natural resources and botany. The work consists of a vitrine filled with little sculptures of fruit and vegetables intricately carved from a variety of natural soaps. These sculptures are accompanied by labels and painted bank notes. The terms on the labels are from the language of economics. The juxtapositions are both amusing and sharply critical: ‘liquid asset’ is a grape; ‘share market’ is a lotus; ‘tax return’ is a peanut; ‘global liquidity’ is a cola nut. Like botany, trade is a system: of classification and collection. Botany is also a science developed to organise the world of nature. ‘Cash crop’ is about these incongruities, similarities and differences, the exploitation of natural resources for commercial interest and the artifice of classification. Natasha Bullock, Contemporary: Art Gallery of New South Wales Contemporary Collection , 'Landscape, mapping, nature', pg.290-331, Sydney, 2006, 310 (colour illus.). Elizabeth Fortescue., Daily telegraph , 'Video Nasties', Sydney, 01 Aug 1997, 41 (illus.). Joanna Mendelssohn, The Australian , 'Creativity as a matter of perspecta', pg 8, Sydney, 08 Aug 1997, 8. Bronwyn Watson, The Bulletin with Newsweek , 'A New Broader Perspective', pg 76, Sydney, 09 Sep 1997, 76. Fiona Hall , 'Contemporary vernaculars', pg.124-153, Annandale, 2005, 140, 141 (colour illus. ).